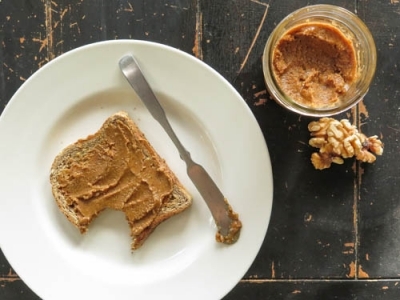 Delicious Walnut Butter with hints of cinnamon, honey, and nutmeg. Preheat oven to 350 degrees. Pour 2 cups of raw walnuts onto baking sheet and toast for 10 minutes (shake pan half way in for even toasting). Once walnuts have cooled, place into a food processor. Pulse 8 to 10 times to break up the walnuts into chunks. Add in the salt, honey, and cinnamon. Now blend for 5 minutes, scraping down the sides of the food processor every 2 minutes. Pour mixture into tupperware or sanitized mason jar. Enjoy on everything!